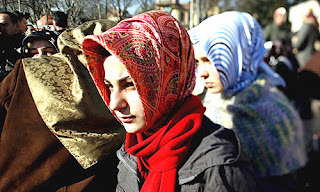 A woman wore a headscarf while she studied and worked in Germany has said she was not even allowed to fill out an application in Turkey because of her headscarf. A. Gülfidan, who studied civil engineering at Ruhr University in Germany, told Today's Zaman she was the only student who wore a headscarf in class and was praised and respected by both her friends and teachers. After graduating and entering the workforce, Gülfidan said she even found wearing a headscarf to be advantageous. The owner of a German company for which she had applied to work saw a photo of Gülfidan in her headscarf and hired her because he reasoned she must have high self-confidence to do so. She went on to work in Germany for seven years. She later married Nazım Gülfidan and moved to Turkey, where she wanted to apply to the Turkish Union of Engineers and Architects' Chambers (TMMOB) for a job. However, she was not permitted to submit an application because of her headscarf. Gülfidan, who at the time was pregnant and trying to adjust to her new life in Turkey, said she had studied and worked for years in a predominantly Christian country wearing a headscarf with no problem. It destroyed her, she said, that she was not able to even apply for a job in her native Muslim country. “They could have at least taken my application and submitted it to the center. I angrily tore up the documents and threw it in front of the officials. I left in tears,” she said. Nazım Gülfidan wrote to the Ministry of Trade and Customs, the General Directorate of Craftsmen and Artisans and other relevant ministries, requesting an explanation. He was told that these were public institutions and, therefore, headscarves and beards were prohibited. A. Gülfidan found the responses absurd. She said she just wants to work for an organization that will allow her to do her job without compromising her identity. “In Germany there are such organizations,” she said.